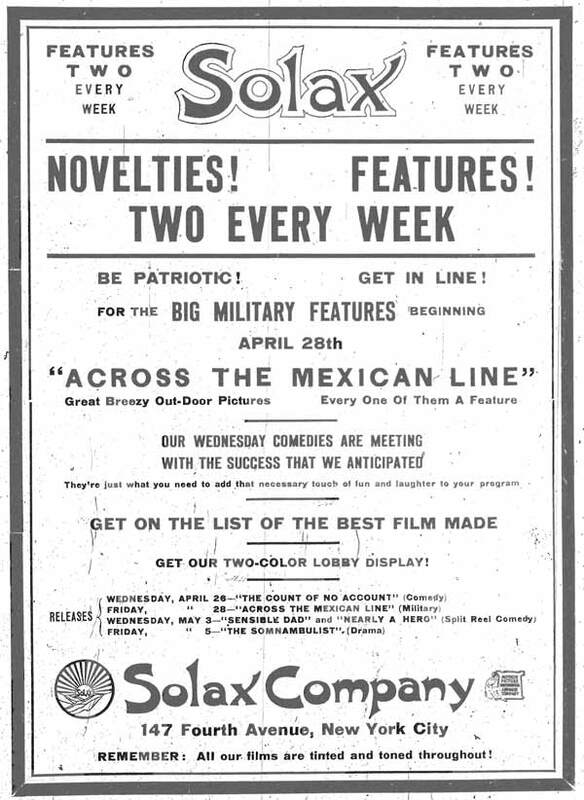 Across the Mexican Line (1911),Industria cinematográfica,Películas silentes extranjeras con temática mexicana,Solax Feature Co.
We notice with a great deal of pleasure and satisfaction the announcement of the Solax Company regarding their Friday release. Beginning April 28th they will start to release their regular Friday military pictures, the first subject of which is entitled Across the Mexican Line. This wide-awake company seem always to be on the alert for an idea that is novel, new and of topical interest. Now what could be more acceptable to the exchangeman and exhibitor than these military pictures dealing with a controversy of current and national importance. Topics that are before the general public always prove to be big money-getter for the exhibitor, and this is the sole aim of the Solax Company–to turn out pictures that will redound the profit of their patrons, the exchangeman and exhibitor in greatest measure. Quite aside from the merely entertaining purposes of these pictures they have the added virtue of being of exceptional educational value as many of the productions will be taken at places of historical interest. This enterprising company will deserve the support and co-operation of all those who are in favor of raising the standard of the picture and making it a medium of not only wholesome entertainment but practical and useful instruction. “Across the Mexican Line” (Solax).—This story is based upon the imbroglio in Mexico. It details a love story, coupled with the thrilling adventures of a woman spy. Apparently the Mexican general did not get the information he wanted, and the prisoner was recaptured by the American troops. The climbing of a telegraph pole and sending a message from its top is a novel stunt which pleased the audience. The situations are also interesting. 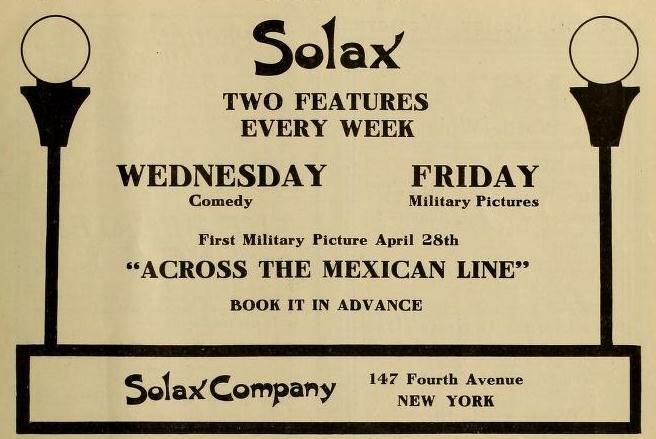 “Across the Mexican Line” (Solax, April 28,).—This film is mentioned again to emphasize the assertion heretofore made that it is sometimes difficult to tell how a picture will take with a different audience. For example, this picture was seen first in New York. It made scarcely a ripple. It was seen again in a crowded house in a small town and was greeted with wild applause. Almost every move the lieutenant made when de Castro surprised him was applauded, while the Mexican was hissed. The girl at work on the telegraph pole sending the message to the American headquarters was almost continuously applauded, and the plunging ride of the American troopers brought forth round after round, closing with an outburst of several minutes when they arrive, stop the execution and capture the Mexicans. The American loves a contest, and if his side wins he is all the more enthusiastic. The illustration of that spirit in this picture pleases the audience in the average theater beyond calculation. There is life, action, but above all that illustration of contrast, the winning of a fight and the exemplification of fair play. Apparently managers will have no difficulty in pleasing their audiences with this picture. 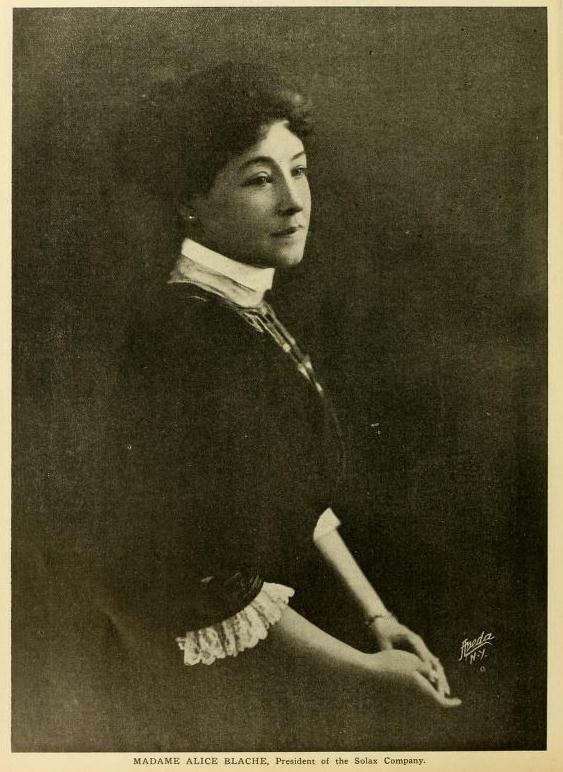 De acuerdo a Alison McMahan en su biografía de Alice Guy Blaché, Across the Mexican fue dirigido por esta última. De ser cierto, sería la primera mujer en haber dirigido una película en el país. La dirección de un film bélico y con una historia de amor interracial resultan una combinación explosiva para el público norteamericano. No sabemos quién se enamora de quién: un gringo de una mexicana o un mexicano de una güerita. Female Mexican characters were more likely to be fetishized though they were usually played by Anglo actresses, as was the Mexican woman in the first of the Solax military pictures, Across the Mexican Line, (Solax, 1911).